Reloading from a previous save. Sometimes you just have to hit the reset button. I have had a very difficult year - and in particular, a very difficult 5 or so months. Over the last number of months, I have had nothing but ample time to reflect on the past, the present, and what I want for the future. I always think it is important to take everything we have happen to us as a lesson - good or bad. We have to take all of the hurt, the lies, the betrayal, the loss - and turn it into something good. Otherwise, we end up steeped in bitterness - and while anger has a purpose, it cannot consume us. "...in the last couple of months, I’ve realized that practically my entire magical life has come to revolve around other people. I don’t do much for myself these days, beyond reading a book every now and then. So I’m trying to go back in time a little and revisit those parts of a personal practice that were so important before I took on the roles that I play now. It’s a weird experience finding myself sort of at the beginning again, rebuilding." So this weekend, D and I decided to hit reset, strip it down to bare bones, and connect with those pieces of our spiritual life that we built from. I want to capture the whimsy and power of when I first started, but looking at it from new eyes - experience, age, and growth. I think knowing where one came from is as valuable as growing from it - the foundation should always be solid, and if it's damaged, you need to go back and repair and bolster and stabilize. I tore every book from it's shelf to evaluate it, and cleaned everything. I picked out a few books I started with to reread. I tore down every altar and shrine, cleaned every piece on it, and put everything back with intention, changing as needed or what no longer suited. 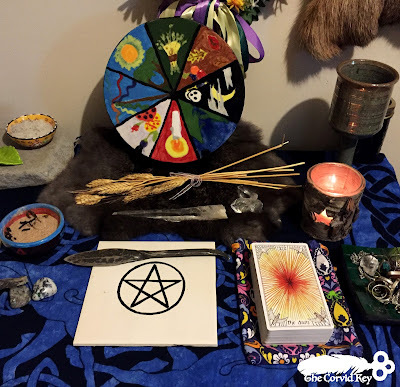 I broke down my complicated altar to something more basic, incorporating pieces from when I started. That tile was made for me by my first teacher, 16 years ago. There's a lot of older, handmade stuff on this altar. I burned natural incense of sage and sweetgrass as offering, lit candles in devotion, and wrote at length of my thoughts, feelings, and hopes. It felt damn good. I am looking forward to a deeper relationship with my gods, with my eyes unclouded and everything simplified. I think learning to hit reset is a valuable thing - it keeps us always questioning, always learning. There is value in going back to the start. The key is not to always hang out there - stagnation is a creativity killer. Starting from a fresh perspective is great, but always keep moving forwards. 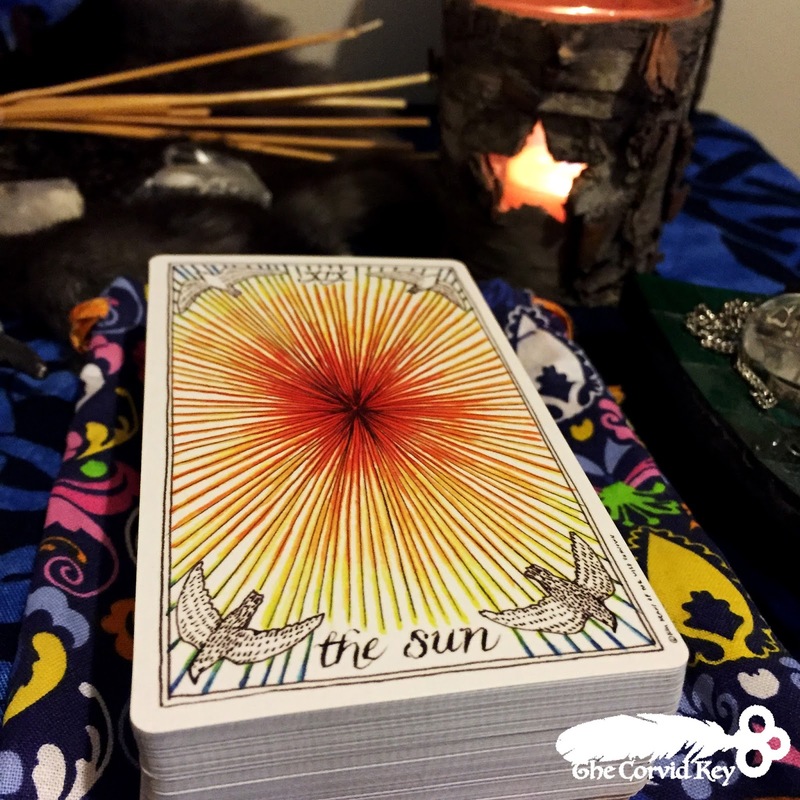 My altar always features a tarot card - something I shuffle and pull every few days to centre me and give me focus. I pulled the Sun, which in this high summer, is exactly what I wanted to see. The Sun is all about optimism, triumph, warmth, and joy. It's the simple pleasures, intellect, and boundless childlike wonder. I am moving forward out of the darkness. I am leaving the shroud behind me, and rising from these ashes like a phoenix. I am reclaiming my strength, my inner warmth. I am embracing warmth and love. I am the Chariot, moving forward, leaving the past in the dust of my wheels. Truthfully, I was wondering when that Chariot from new years was going to rear it's head. Here it is. With needed direction and momentum. I welcome this reset with open arms. It is so needed. And now, for a little East Coast inspiration - in hopes we all rise again. Aries. Eclectic traditional folk witch with a northern European and heathen bent. IDGAF Tradition initiate / founder. Photographer. Queer. Geek. Bibliophile. I am a massive geek, and love video games, roleplaying (tabletop White Wolf represent! ), board games, and graphic novels. I am a photographer, painter, weaver, and occasional sculptor. I identify as a northern European traditional folk witch, and practice folk witchcraft - drawing on cultural roots, local folklore, mythology and folk tales. I blog on in a less structured way on tumblr, and am a founding member of the IDGAF Tradition of Witchcraft. So I'm getting married. It's legit a thing.